Spring 2019 Program: Come On In, The Water's Fine! The WCC Concert Band was formed in 1989 under the direction of Dr. Jack O. White and presented its first concert on December 12 of that year. White was Director of Bands at Elon College from 1962 until his retirement in 1986. Before going to Elon, White had been a very successful high school band director in Southwest Virginia, including service at George Wythe High School in the 1950's. He led the band through its holiday concert of 1998, afterward joining the band's trumpet section. During his tenture as the band's director, White was the recipient of the WCC Distinguished Service Award. He was named Director Emeritus of the WCC Concert Band in 2012. With the spring concert of 1999, Bill Svec took over the director's baton and led the band through its 2013 season of performances. Svec served as director of the George Wythe High School Band in the 1960's and was band director at Cave Spring High School in Roanoke County until his retirement. In the spring of 2014, the band began performing under the direction of Frank Pugh. Pugh is a 1987 George Wythe High School graduate and has served as the band director at Fort Chiswell High School and Middle School for the past 18 years. The WCC Concert Band is comprised of community members from all walks of life, including music teachers from area schools, students at the community college, and local high school students. 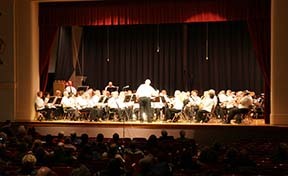 The band presents an annual holiday concert in December and a spring concert in May. Performances are given in the George Wythe High School Auditorium in Wytheville. Concerts are free and open to the public. In the past, the band performed at the Wytheville Chautauqua Festival and the WCC Graduation Ceremony. From time to time, the band went on the road to Roanoke's Festival in the Park, the Dollywood theme park in Tennessee, and to various high schools for evening performances throughout the area. Wytheville Community College is proud to sponsor this organization, which has provided such a valuable opportunity for adults in the community to continue their development as musicians beyond their high school and college years. The contribution to the community at large has been significant as well. The band consistently has performed before large crowds, and audiences have been most appreciative over the years.